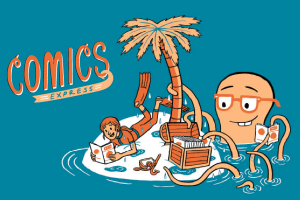 Comics Express is a limited-edition comic book conceived by Carmen Morais (a former editor at Nickelodeon Magazine) to benefit kids affected by the tornado in Joplin, Missouri, which destroyed 30% of the city and made thousands homeless. She assembled a bunch of award-winning comic artists and former colleagues from Nickelodeon to donate the content and labor. The comic book will give young kids up to teens something more fun to think about than damaged neighborhoods and uprooted lives. The Joplin Public Library will coordinate with local groups to distribute the comic books to kids free in July. Verdict: Teen Summer Class at Cornish Rawked. 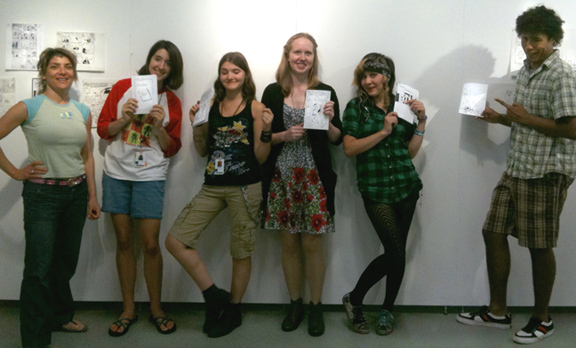 I had an awesome bunch of budding cartoonists in my classes at Cornish this summer. The Session 2 class’s final minicomics and original work will be on display today between 2:00pm – 7:00pm on the Cornish campus, in a big performance/exhibit extravaganza of all the summer classes. Every year, I am blown away by their work. You will be like, wow, these are teens? Here’s the schedule online and after the jump. A Big Curtsey to the Seattle Weekly! Hey! The Seattle Weekly just came out with their 2011 “Best of Seattle” awards, and they voted me “Best Local Cartoonist.” With many nods of respect to the many excellent cartoonists in town, thank you, Seattle Weekly!